Background and objectives: Subacute sclerosing panencephalitis (SSPE) is a progressive catastrophic neurodegenerative disease because of persistent measles viral infection in the brain. This study was designed to determine the spectrum of magnetic resonance imaging (MRI) findings in subacute sclerosing panencephalitis. Design: Case series. Methods: We described the brain MRI findings in 20 pediatric patients with confirmed SSPE with their clinical and electroencephalogram (EEG) correlates. This study was conducted at Aga Khan University Hospital, Karachi, Pakistan between January 2006 and June 2016. Diagnosis of SSPE was on the basis of the clinical signs and symptoms, the characteristic EEG patterns (burst suppression in the early stage and a diffuse, random, slow arrhythmia pattern in the late stage), and high titers of measles antibody in the cerebro-spinal fluid. Results: The mean age at presentation was 7.4 ± 3.3 years. MRI abnormalities included diffuse white matter changes (n = 8), subcortical T2 hyperintesities in both grey and white matter in 1 patient and the brainstem changes in 2 patients. MRI was normal in 8/20 patients. Magnetic resonance spectroscopy (MRS) was performed in 4 patients out of whom 1 patient showed reduced N-acetyl aspartate (NAA) peak with elevated choline peak and inverted doublet lactate peak, 1 showed only reduced NAA, 1 showed isolated choline peak and 1 patient had a normal MRS. Conclusion: MRI brain to date is supportive in understanding the pathology of SSPE. MRI can be normal in patients with SSPE if done early on at the start of the disease. Background and objectives: Cerebral palsy typically results from brain injury during prenatal, perinatal, or infant period. Established medical management involves rehabilitation therapy with comprehensive multidisciplinary approach to minimize various complications and to improve brain plasticity. Recently, direct brain tissue modifying therapy using stem cell therapy has been investigated as a new therapeutic modality. In this study, the combination therapy of allogeneic umbilical cord blood and/or erythropoietin is investigated to find out the efficacy and safety in children with cerebral palsy over empirical rehabilitation therapy. Design: A randomized, double blind, controlled trial. 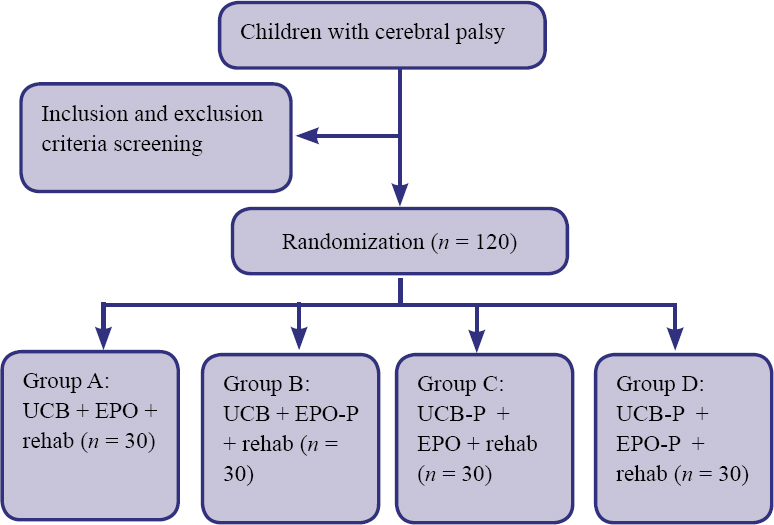 Methods: Patients with cerebral palsy who visited Rehabilitation medicine center in CHA Bundang Medical Center, Republic of Korea from October 2013 to October 2015 are included in this trial. A sample size of 120 patients is needed. Patients will be randomly assigned to three groups of cord blood treatment or a control group. Cord blood treatment group will receive either cord blood and erythropoietin, or cord blood and erythropoietin placebo, or placebo cord blood and erythropoietin in addition to conservative rehabilitation therapy. 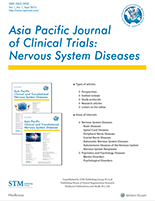 Outcome measures: The primary outcome of the study is the efficacy of combination therapy of allogeneic cord blood stem cell and erythropoietin and either monotherapy in terms of the change from baseline motor function assessments including Gross Motor Function Measure, Gross Motor Performance Measure, motor and mental subscales of Korean version Bayley Scales of Infant Development, 2nd edition. The secondary outcomes of the study include other functional assessment tools, imaging studies (fractional anisotropy of diffusion tensor imaging and positron emission tomography), electroencephalography, and evoked potentials. Discussion: The results of this trial will provide optimal evidence of cord blood transplantation with or without erythropoietin as a therapeutic modality in children with cerebral palsy. Ethics and dissemination: The study will be reviewed by IRB. The results of the trial will be published in a peer-reviewed journal and will be disseminated via various forms of media. Trial registration: This trial had been registered in the ClinicalTrials.gov (identifier: NCT0199114) on 17 November 2013. Background and objectives: Bipolar disorder (BD) is a neuropsychiatric disorder characterized by cyclic changes in mood between hypoactive, pessimistic (depressive phase) and hyperactive, optimistic (manic/hypomanic phase). Prior studies in major depression patients show that the right side of the vestibular system (inner ear's equilibrium system) is less active compared to the left. It suggests a relationship between mood and abnormal lateralization of the vestibular activity. This exploratory investigation analyzes the right and left vestibular activity in different mood phases of BD and healthy controls. Design: A transversal cross-sectional study. 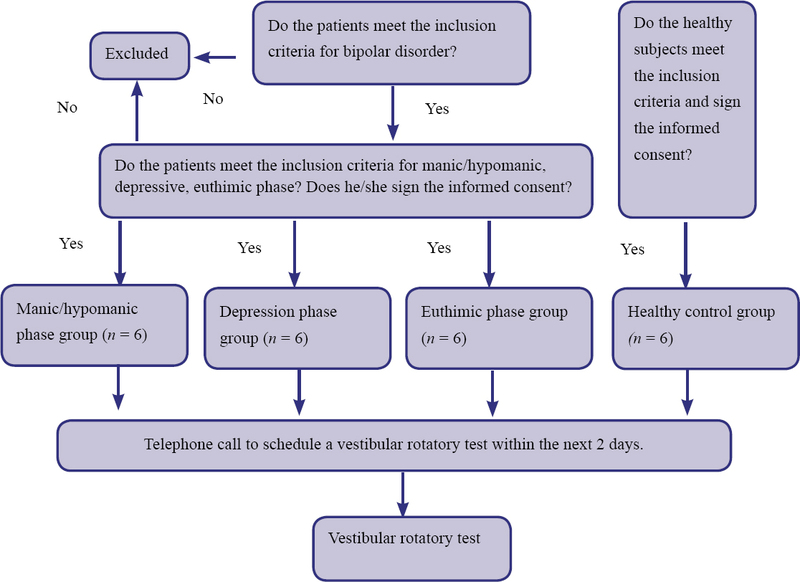 Methods: We will study and compare the lateralization of the vestibular activity of BD I or II patients, who match the selection criteria for different mood phases: depression, mania/hypomania, euthymia and healthy controls (6 patients each group). Outcome measures: For vestibular evaluation, we will use rotary chair technique and electronystagmography. The primary outcome measure is the per- and post-rotatory asymmetry. The secondary outcome measures are the slow phase velocity of the nystagmus, the rhythmicity of nystagmus, and the type of slow ocular tracking. Discussion: This study addresses the relationship between mood states and abnormal right-left side lateralization of the vestibular activity in BD patients. Ethics and dissemination: The study protocol was approved by the ethics committee of Servicio de Salud Metropolitano Oriente, in Santiago, Chile on June 21st, 2016. Participants will provide written informed consent prior to participation in the trial. Trial registration: ClinicalTrials.gov identifier: NCT02827045 on July 6th, 2016. Background and objectives: Repair of the damaged skull is necessary after decompressive craniectomy. Previously used autologous bone, allogeneic bone, and organic material are associated with the risk of an unsatisfactory cosmetic outcome and infection. Titanium mesh is an ideal material for cranioplasty. Digital three-dimensional shaping of titanium mesh allows it to perfectly match the skull defect and can restore the anatomic appearance of the defective area. Design: Retrospective case analysis. Methods: We analyzed the surgical and follow-up data of 38 patients with skull defects who underwent subtemporal repair using three-dimensional shaping of a titanium plate at the Department of Neurosurgery, Wujiang Hospital (The First People's Hospital of Wujiang District), Nantong University, China, from January 2015 to December 2016. Outcome measures: The primary outcome measure was the incidence of complications within 12 months after surgery. 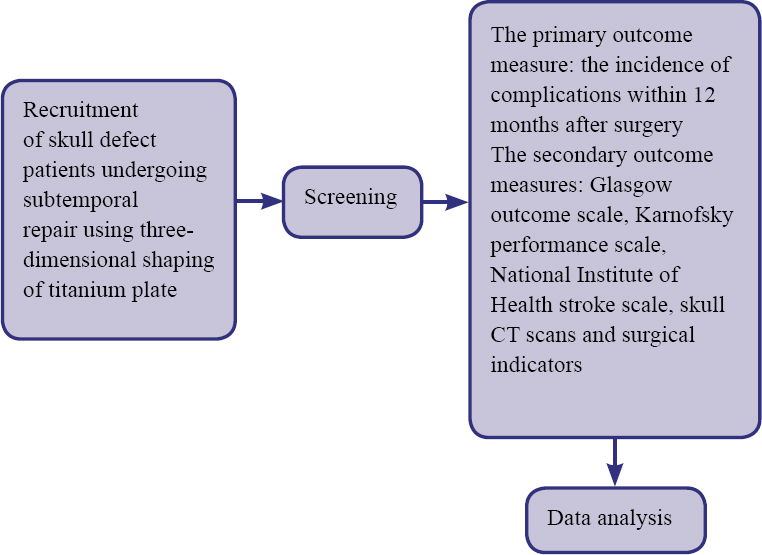 The secondary outcome measures were the Glasgow outcome scale score, Karnofsky performance scale score, National Institutes of Health stroke scale score, and skull computed tomography scan results at 1, 6, 12, 18, and 24 months after repair. Partial results have been obtained for 38 patients who have been followed up for 6 to 24 months. No complications or adverse reactions occurred. Skull computed tomography scan results revealed that the titanium mesh and nail were well fixed, the skull shape was symmetrical, and no subcutaneous effusion or intracranial hemorrhage occurred. Discussion: Complications, neurological function, and imaging findings in patients with frontotemporal skull defects provide an experimental basis for three-dimensional shaping of titanium plates in subtemporal repair of frontotemporal defects. Ethics and dissemination: The study design was completed in May 2017. The protocols had been approved by the Ethics Committee of The First People's Hospital of Wujiang District in June 2017. This trial was registered in October 2017. Data of patients, who were treated from January 2015 to December 2016, were analyzed in June 2017. Data analysis will be finished in December 2017. The results of the trial will be published in a peer-reviewed journal and will be disseminated via various forms of media. Trial registration: This trial has been registered in the Chinese Clinical Trial Registry (identifier: ChiCTR-IOC-17012947). All data collection and analysis are currently ongoing. During neurosurgical operations, the soft material of the brain, the cerebrospinal fluid (CSF), the opening of the skull's cavity, the opening of the dura mater, the CSF loss along with gravity and other factors make the brain susceptible to the brain-shift phenomenon (displacement of the brain in relation with its natural position captured during imaging acquisition). As a result, after some point of the operation the neurosurgeon cannot really rely on the navigation system's guidance. The navigational inaccuracies caused by the brain-shift phenomenon and the demand for updated intraoperative imaging acquisition aiming to increase accuracy and reliability led to the development of intraoperative imaging systems. Such systems are the intraoperative ultrasound device, and the intraoperative computed tomography (ioCT) or magnetic resonance imaging (ioMRI) scanners. Each system is characterized by its own advantages and disadvantages, which are described in the present review. As a conclusion, intraoperative imaging systems provide very important advantages in various types of operations by updating the imaging scan. However, their benefit is unclear in some instances, while ioCT and especially ioMRI are associated with huge costs affordable only by specific hospitals worldwide.